One of the benefits of being a freelance writer is making my own schedule, and having the flexibility to change that schedule if I want to. For instance, I am not a morning person, and in fact joked that I’m part vampire in this post here because I write best after sunset and terribly at sunrise. Luckily, as a freelancer, I have the freedom to write well into the night and sleep in in the morning. My flexible schedule also enables me to take long lunches with friends, visit my parents mid-week when renting a car is cheaper, and enrol in a weekly trampoline class that starts at 4pm – all because I don’t have to complete my work during a regular 9-to-5 schedule. However, it’s important to note that doing these things means I have to make up work hours in the evening or on the weekend. Now, when I’m working for a client, it’s easy to protect those hours. Everyone understands having a deadline and a boss. But when I’m working on my novel, not so much. Now my friend knows I’m working on a novel and she meant no disrespect by this question, but as is often the case, people who are not writers or artists themselves don’t see your personal creative projects as real work. To her, I was free to hang out, so she was a bit miffed that I refused. And then I felt bad for being an un-fun friend. Just because you don’t have a paying client or a publisher (yet) for your project, doesn’t mean you don’t have a deadline. I like to call this excuse The Truth Edited, because, technically it is true (I am always chasing a deadline because I set goals for myself), but I leave the part out about me being the one who set this deadline. Sure, in an ideal world, I wouldn’t have to edit the truth, but in reality most people don’t respect personal deadlines as much as client deadlines. So sometimes I lead my friends to believe that someone else is waiting on that outline or draft. Even better is if someone is expecting it, like a beta reader or a critique partner. I’m sick. / I have an appointment. / I’m waiting on a delivery. These are go-to White Lies. Because they are common excuses, people might doubt them if you use them too much, so make sure the white lie isn’t the only excuse in your arsenal. Of course, to make it extra convincing, you could have sick photos on hand that you can text. And don’t hold back the fake gory details – that always make people stop asking questions. Though if you have one of those friends who is stuck in the 20th century and still uses their phone to make actual calls, have your best nasally voice or fake cough ready when you answer. Or try tip #5. I can’t today, but what about this weekend? If you’re not cool with The White Lie, The Deflection might be more your style. By suggesting another hang out time and making future plans, your friend should be distracted enough not to ask you to explain exactly why you’re not available at that moment. Note: this doesn’t work on nosy friends, so make sure you have another excuse as backup. I’d love to, but I have to work on this top secret project! This is totally true if you haven’t given out the details of your novel. The Secret also makes what you’re doing sound super exciting so that your friend is excited for you and less likely to be upset. This excuse has the added bonus of ensuring that you actually get stuff done so you really do have exciting news to reveal when you next see your pal. Set automated responses on your phone/email during your writing time to avoid distracting invites, and instruct friends to leave a message or call back after a certain time. I call this The Digital Secretary because I think of these auto responses as being like a bigwig’s secretary, keeping people out of the office and holding calls when they don’t want to be disturbed. The good thing about this one is if there is a bonafide emergency, you still get the message and can respond, but otherwise you can guiltlessly ignore all the non-emergencies. Pro Tip: vary these excuses. I use 1, 2 and 3 regularly, but will add 4 and 5 to the repertoire soon. Ideally, we should proudly protect our writing time and just tell the truth, but if you’re like me and have a rubber arm that is easily twisted into going out, or always feel guilty when you disappoint friends by refusing their invites, using these excuses just makes things easier. Writing is hard enough, so give yourself some leeway when protecting your writing time. 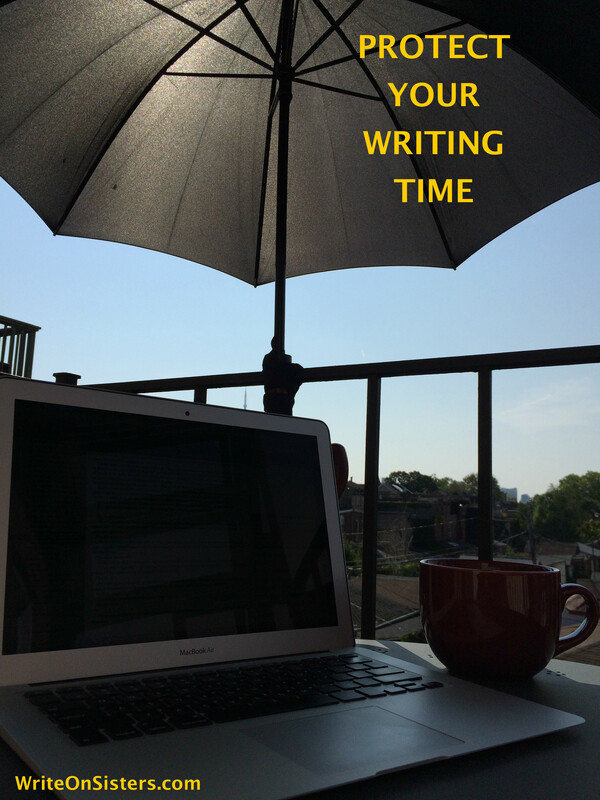 How do you protect your writing time? Share in the comments! Allow me to clarify. I do indeed have friends. But my solution to the problem of getting sidetracked by friends is to just not acquire them in the first place. Right? I’m not saying it’s a healthy solution, or a particularly good one, but it would definitely work! So, Rule number one: Don’t have friends. Rule number two: Don’t have a life beyond writing. Rule number three: Don’t have any furniture other than a writing desk and chair. Sounds bleak. Maybe these aren’t the optimal solutions. Thanks for the cyber hug. I feel it! So true! I have definitely hid in my room from roommates/family and pretended I was sleeping in order to get some writing time in. Luckily now I live with my boyfriend who is very understanding. Great topic, Heather! All of the subterfuge is fun, but I prefer to state flatly that I’m committed to my current project, which is often viewed as surprising by people who underestimate the work ethic of those who work from home. I continue to explain what the life of a writer is like, explaining that while one novel is complete and with a content editor for review now, I’m researching and outlining the next novel. I explain the deadlines I’ll have to meet on rewrite, to get the first novel to the copy editor I’ve hired and paid a deposit to; and to finalize my literary agent and small press research to ready my novel for submission. I finish with a sense of pride that I’ve made clear that my commitment is just as valuable as someone who goes to an office 9-5, and I think it’s important to be honest about it. Hopefully I’m raising consciousness somehow . . . I hope you are too, and I applaud your honestly! It probably comes down to my own self-respect — I’m not yet making money as a novelist (that will require many more months finishing this book), so it doesn’t seem like a real job, even though the amount of work I pour into it can be much more. I use a combination of these but the deadline one seems to be the only one that works, especially if people think someone is waiting on what I’m doing! I have to jealously guard my time. Its’ a challenge! Indeed, it seems as if this is an issue for most writers. Good luck! Yeah, I like the idea of sounding like a secret agent or something. 🙂 Thanks for reading! That is very true! Thanks for the comment, Diane. You can complain here. This is a writer safe space. 😀 Solidarity! What if the “friend” who pulls us from our writing is ourselves? I can’t tell you how many times I’ve invited myself to Peet’s Coffee for a chocolate Javiva, or to the park to read a book, or to Trader Joe’s for groceries or…well, you get the drift. *sigh* I get this a lot. I usually just say “I’m sorry, I have a commitment.” For the especially nosy, I do use “deadline,” though. I don’t think any writer escapes this problem! I myself have to work on making vague commitment excuses sound super important. I am so very bad at the white lie. Yes, it can also be hard for family to respect writing time. I know my parents are always like, “Why can’t you come visit?” And I’ll tell them that I’m writing and don’t have time to make the 6-hour round trip, and suggest, since they are retired, that they come visit me. To which my mom always replies, “But we’re so busy with church and square dancing and pickle ball. Just come see us!” Sigh. Previous Previous post: Reviewing a Friend’s Book on Amazon?